Officially known as the Canadian Forces 431 Air Demonstration Squadron, the Snowbirds that were formed in 1978 are Canada's military aerobatics or air show flight demonstration team. The purpose of the team is to demonstrate the skill, professionalism and teamwork of Canadian Forces personnel. The squadron is based at 15 Wing, near Moose Jaw, Saskatchewan. 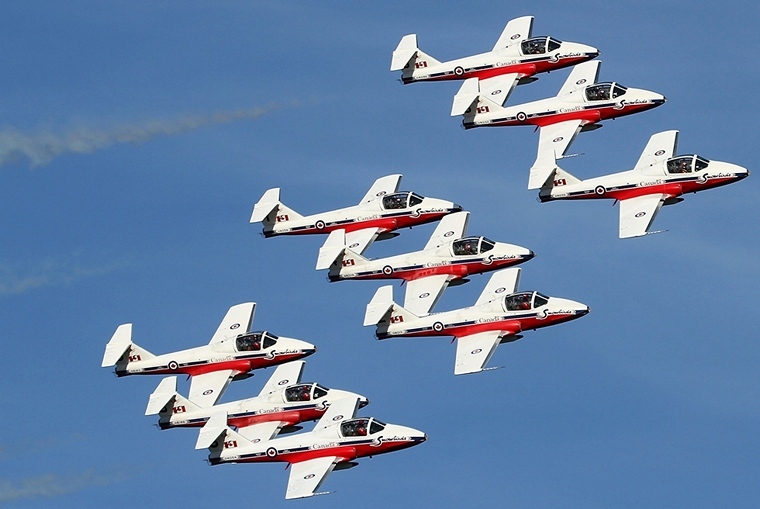 A contest to give the air demonstration team a formal name resulted in the name Snowbirds. The name reflected the aircraft's distinctive mostly-white paint scheme used at the time, connoted grace and beauty and was clearly linked to its Canadian origins. 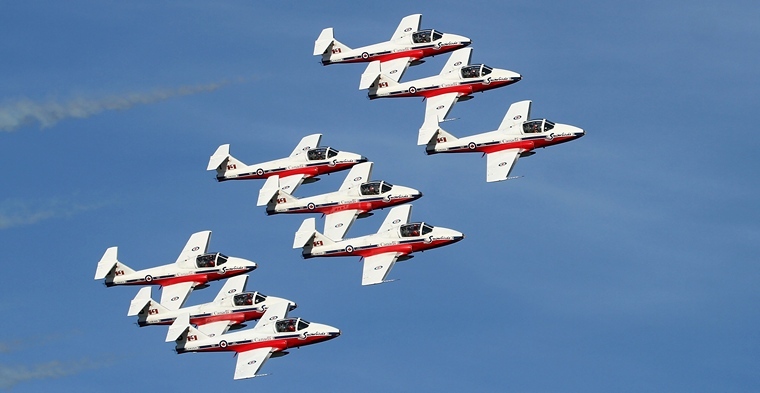 The first performance of the team with the new name of "Snowbirds" was on 11 July 1971 at their home base of CFB Moose Jaw during the Homecoming '71 Air Show. The history of 431 (Iroquois) Squadron Royal Canadian Air Force (RCAF) dates back to WWII when the Squadron was formed at Burn, near Selby, on 11th November 1942 as a bomber unit of No. 4 Group. In mid-July 1943, it was transferred to No. 6 (RCAF) Group at Tholthorpe and early in December that year moved to Croft, its last home in the UK. The squadron was first equipped with Wellington Xs, converting to Halifax Vs coincident with its move to Tholthorpe. In December 1943 the Squadron was transferred to Croft where it was equipped with Lancasters and remained until the end of the war. Over the course of the war 431 Squadron completed over 3000 operations across the European Theatre. In September 1961 the Canadian government ordered 190 Canadair CL-41 Tutors. The Tutor that had its first flight on 13 January 1960 was the product of the Canadair Preliminary Design department went to serve for over thirty years as the primary trainer of the RCAF. In 1976, the Canadian Forces modified 113 remaining aircraft with upgraded avionics and provisions for two belly-mounted 41 US gal (155 l) external fuel tanks. 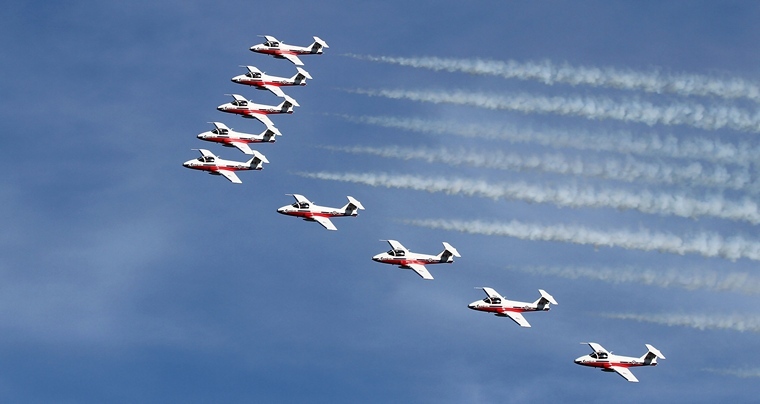 Modifications for the Snowbirds include a smoke generating system, a unique paint scheme for added crowd appeal and a highly tuned engine to enhance engine response in low-level flying. 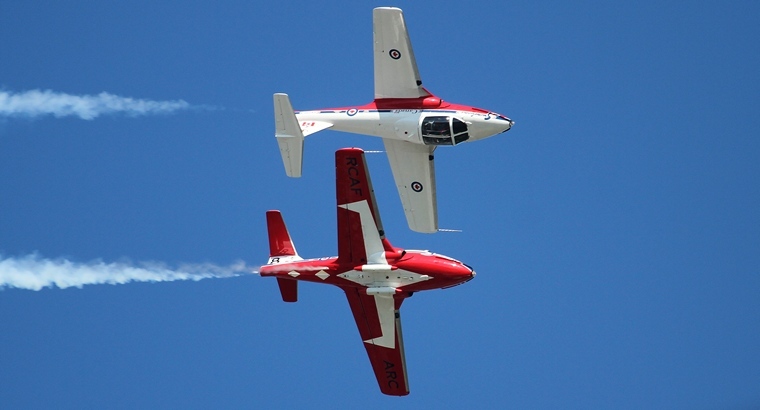 Although the CL-41 Tutor has been retired from active training, 22 Tutors continue to fly with the Canadian Forces Snowbirds and the Aerospace Engineering Test Establishment at CFB Cold Lake. A number of airframes are held in reserve for future deployment as replacement Snowbird aircraft. Approximately 80 Canadian Forces personnel work with the squadron full-time of which 24 personnel are in the show team that travels during the show season. The show team flies eleven Canadair CT-114 Tutors; nine for aerobatic performances, including two solo aircraft. Two are kept as spares in case of a malfunction. The spare aircraft are flown by the team coordinators. Fresh formations and manoeuvres are designed each season by the team. All displays must be approved by the Canadian Forces, Transport Canada and since the team performs in the United States by the US Federal Aviation Administration. Training occurs over several months. Once manoeuvres are mastered and the team is comfortable with the routine, the Snowbirds deploy to CFB Comox for specialized training. After approvals are obtained, an "acceptance show" is performed at Moose Jaw to allow representatives from the three approving agencies to see a live performance to ensure that safety guidelines are complied with. The Snowbirds were the first aerobatic team in the world to use music in their show and live commentary from the performing pilots flying at speeds between 100 knots (190 km/h) and 320 knots (590 km/h). Separation between aircraft in most of the maneuverers can be as close as 1.8 metres (5.9 ft) except when two aircraft perform head-on passes when they aim to be about 10 metres (33 ft) apart. Three shows are designed to suit the different weather conditions that may be encountered on show day; an unrestricted high show for clear and high cloud base days, a modified high show where loops are not permitted because of cloud, and a low show where low cloud conditions do not permit higher manoeuvres. Some elements of the show are passed down from one season to the next. These include the Canada burst, heart, downward bomb burst, solo head on crosses and their signature 9-abreast exit. The Snowbirds whose primary schedule commitment each year is to Canadian air shows fly at approximately 60 air shows each year. They first performed in the United States occurred on 27 November 1971 at Williams Air Force Base near Phoenix, Arizona and on 17 September 2005 they performed their 2000th official air show at Reno, Nevada. Their first appearance at AirVenture was in 1983 and in 2016 after a more than 30 year absence they got the crowds to flock to the afternoon shows with their nine ship graceful close formation display of loops, rolls, solo passes and seamless formation changes. Good news is that the Snowbirds in the Tutors will be a part of airshows for at least the next nine years. The Tutors are only set for replacement between 2026 and 2035 with a platform will be interchangeable with the RCAF training fleet to ensure the hard demands of show performances can be distributed throughout the aircraft fleet.